through crop residue, and improve soil quality. tractable P, exchangeable K and sulphate-S). 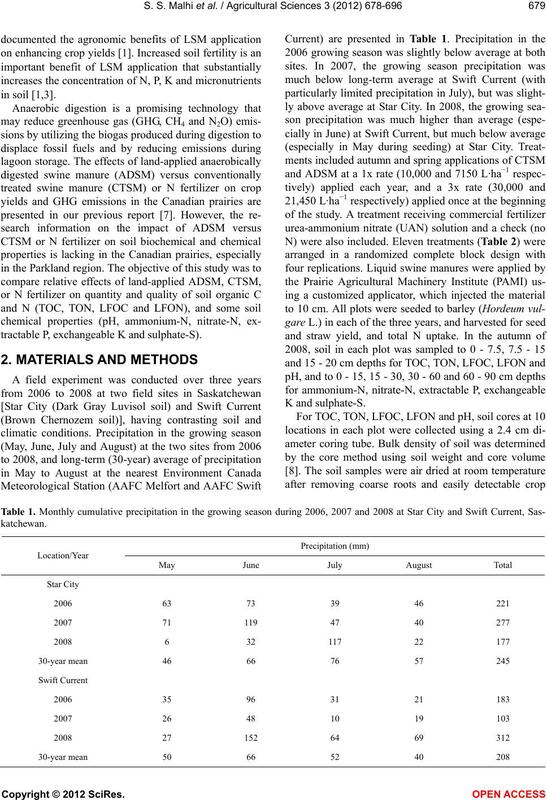 plied liquid swine manure (LSM) during a three-year (2006-2008) field study at Star City and Swift Current, Saskatchewan. 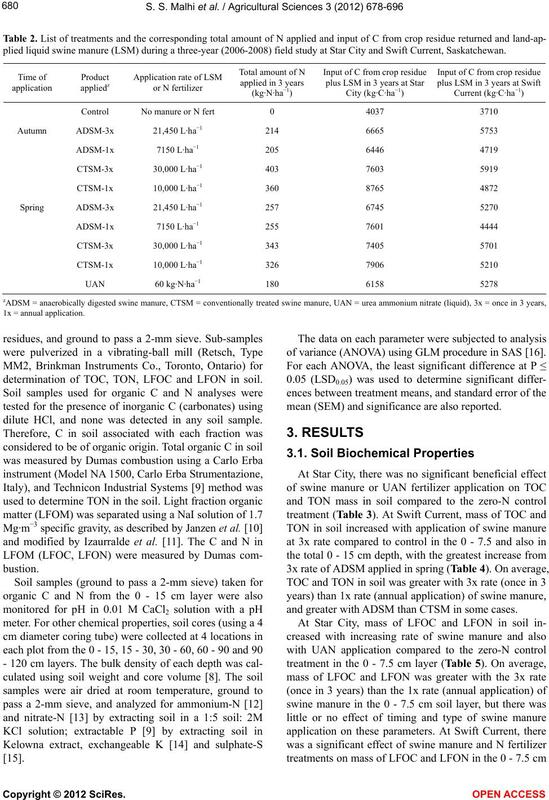 determination of TOC, TON, LFOC and LFON in soil. dilute HCl, and none was detected in any soil sample. of variance (ANOVA) using GLM procedure in SAS . mean (SEM) and significance are also reported. 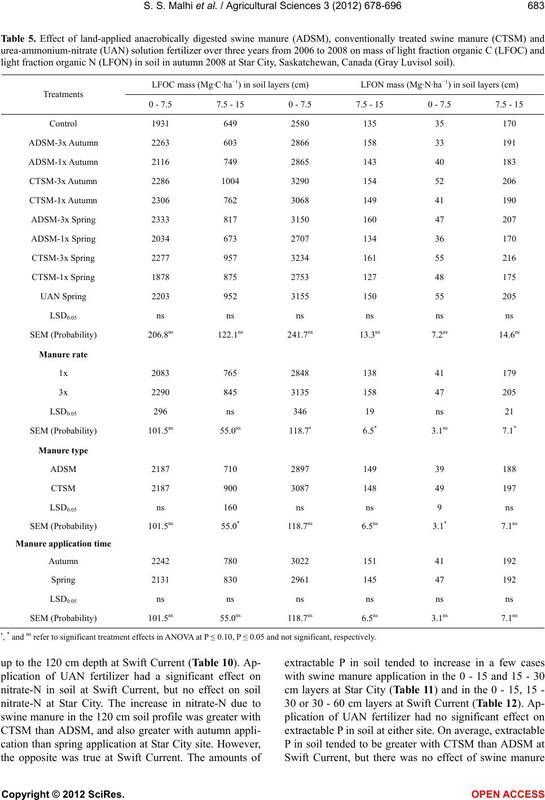 and greater with ADSM than CTSM in some cases. 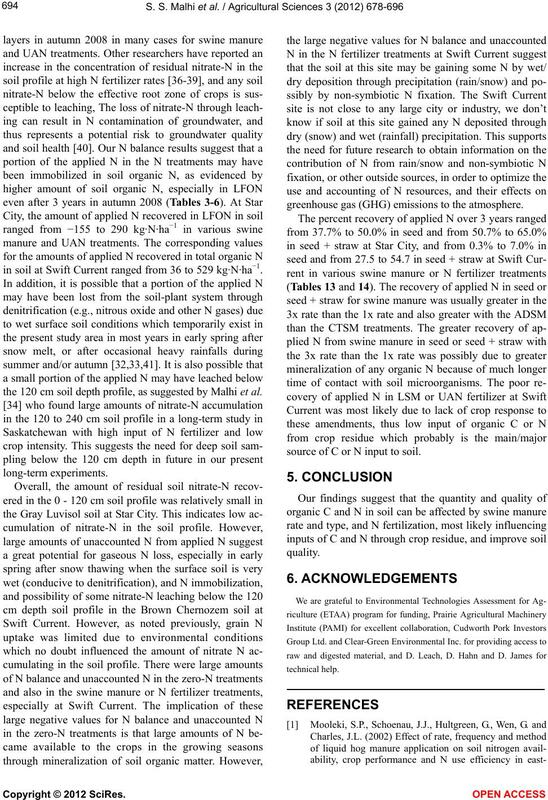 organic N (TON) in soil in autumn 2008 at Star City, Saskatchewan, Canada (Gray Luvisol soil). 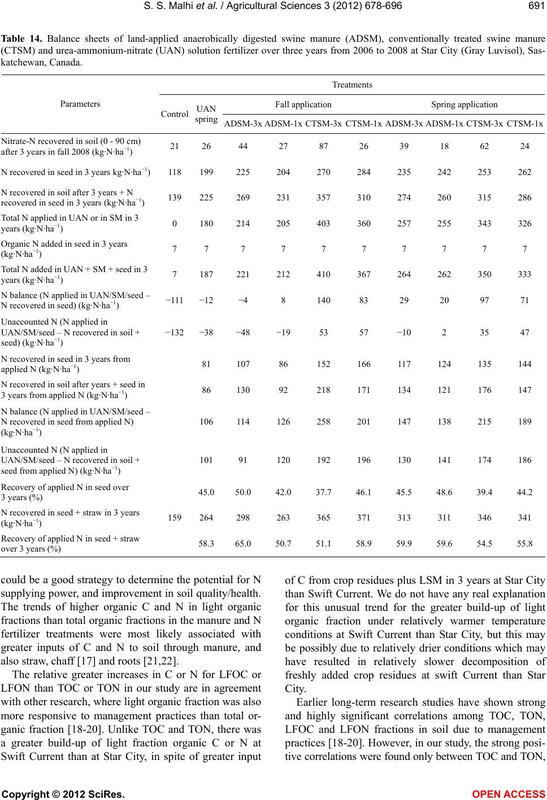 • and ns refer to significant treatment effects in ANOVA at P ≤ 0.10 and not significant, respectively. swine manure application on these parameters. organic N (TON) in soil in autumn 2008 at Swift Current, Saskatchewan, Canada (Dark Brown Chernozem soil). •, *, **and ns refer to significant treatment effects in ANOVA at P ≤ 0.10, P ≤ 0.05, P ≤ 0.01 and not significant, respectively. was significant for LFOC and LFON at Swift Current. LFOC and LFON at Swift Current (Table 8). 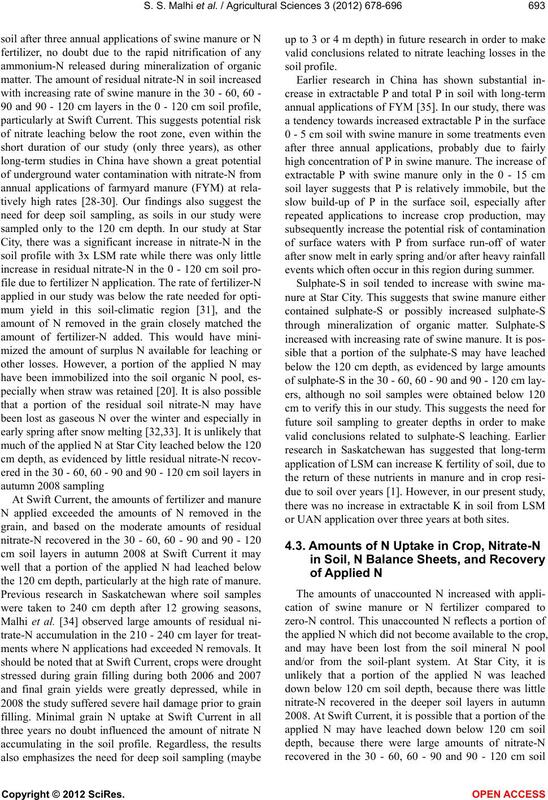 light fraction organic N (LFON) in soil in autumn 2008 at Star City, Saskatchewan, Canada (Gray Luvisol soil). 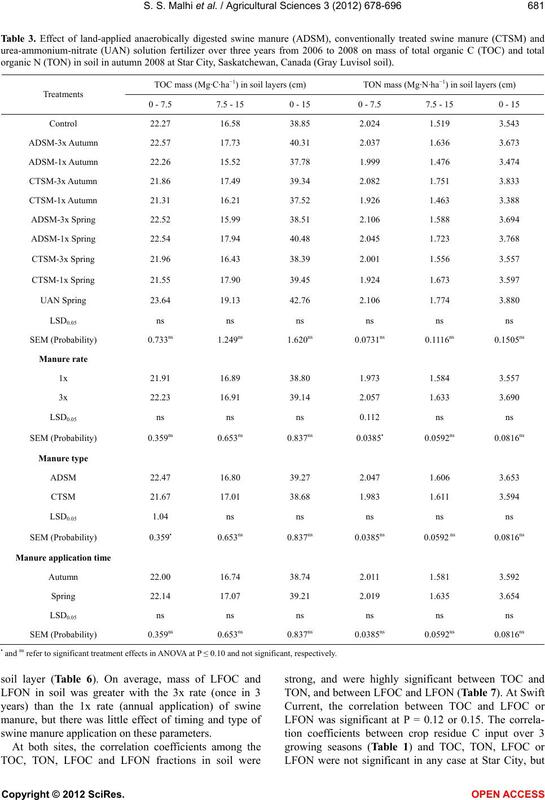 •, * and ns refer to significant treatment effects in ANOVA at P ≤ 0.10, P ≤ 0.05 and not significant, respectively. light fraction organic N (LFON) in soil in autumn 2008 at Swift Current, Saskatchewan, Canada (Dark Brown Chernozem soil). • and ns refer to significant treatment effects in ANOVA at P ≤ 0.10, P ≤ 0.05, P ≤ 0.01, P ≤ 0.001 and not significant, respectively. 2008 at Star City (Gray Luvisol) and Swift Current (Dark Brown Chernozem), Saskatchewan, Canada. •, **, *** and ns refer to significant treatment effects in ANOVA at P ≤ 0.10, P ≤ 0.01, P ≤ 0.001 and not significant, respectively. Swift Current (Dark Brown Chernozem), Saskatchewan, Canada. 0.01 and not significant, respectively. 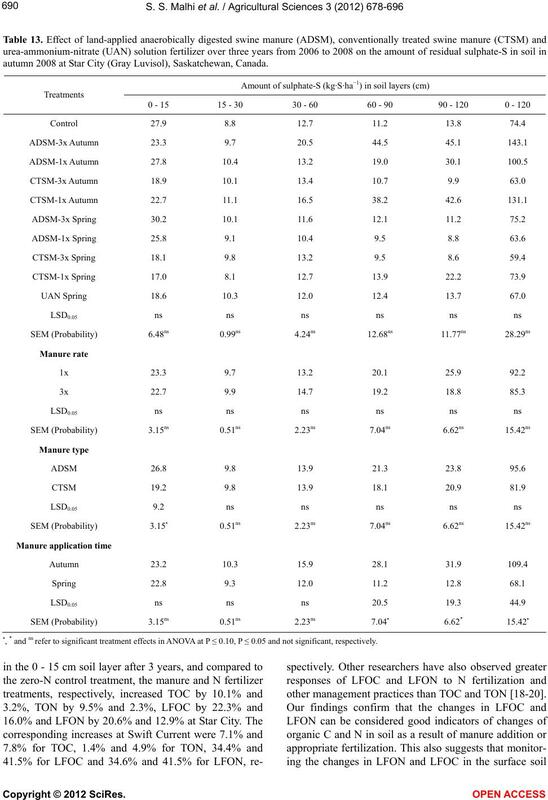 in various treatments ranged from 139 to 357 kg·N·ha−1. autumn 2008 at Star City (Gray Luvisol), Saskatchewan, Canada. 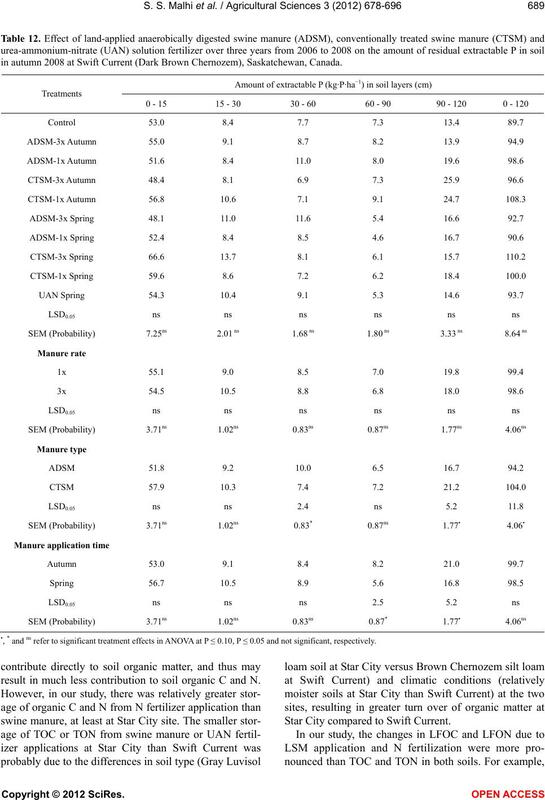 •, *, **, *** and ns refer to significant treatment effects in ANOVA at P ≤ 0.10, P ≤ 0.05, P ≤ 0.01, P ≤ 0.001 and not significant, respectively. autumn 2008 at Swift Current (Dark Brown Chernozem), Saskatchewan, Canada. 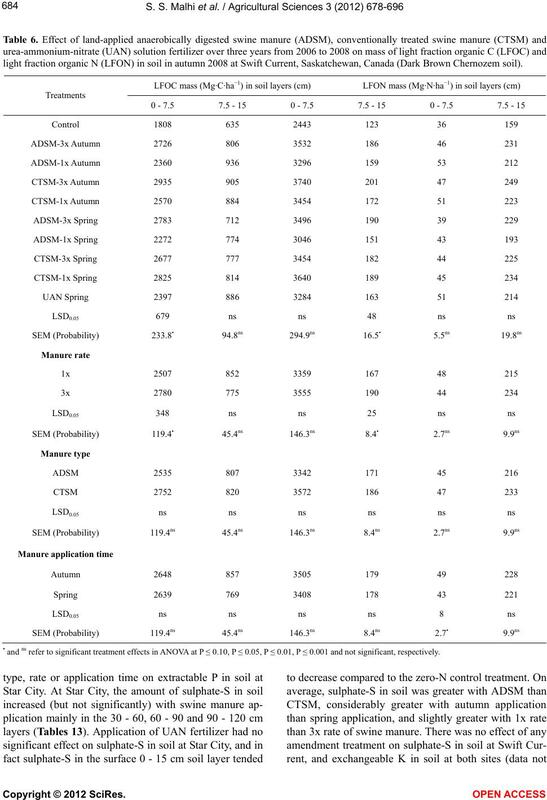 the ADSM than the CTSM treatments. in autumn 2008 at Star City (Gray Luvisol), Saskatchewan, Canada. in autumn 2008 at Swift Current (Dark Brown Chernozem), Saskatchewan, Canada. 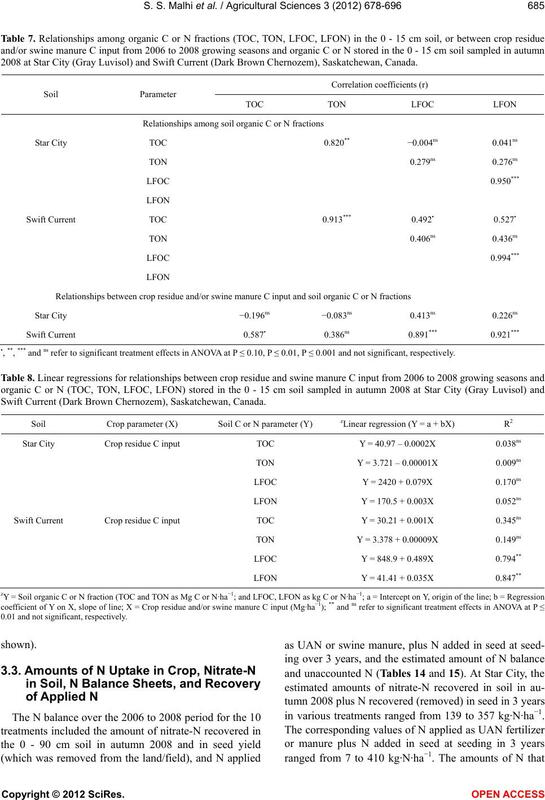 result in much less contribution to soil organic C and N.
Star City compared to Swift Current. other management practices than TOC and TON [18-20]. supplying power, and improvement in soil quality/health. also straw, chaff  and roots [21,22]. soil pH even after 10 annual applications. the 120 cm depth, particularly at the high rate of manure. events which often occur in this region during summer. or UAN application over three years at both sites. in soil at Swift Current ranged from 36 to 529 kg·N·ha−1. the 120 cm soil depth profile, as suggested by Malhi et al. greenhouse gas (GHG) emissions to the atmosphere. source of C or N input to soil. Mooleki, S.P., Schoenau, J.J., Hultgreen, G., Malhi, S.S.
 Schoenau, J.J., Mooleki, S.P., Qian, P. and Malhi, S.S.
ernment of Saskatchewan, Regina Saskatchewan. Lemke, R.L., Malhi, S.S., Selles, F. and Stumborg, M.
cultural Scie nces , In Review. Lewis Publishers, Boca Raton, 529-549. Janzen, H.H., Campbell, C.A., Brandt, S.A., Lafond, G.P. of America Journal, 56, 1799-1806.
mation techniques. In: Lal, R., Kimble, J.M., Follett, R.F. January 1978. Technicon Industrial Systems, New York. nications in Soil Science and Plant Analysis, 25, 627-635. University of Missouri, Columbia, 35-39. SAS Institute Inc. (2004) SAS product documentation. rotation cycle. 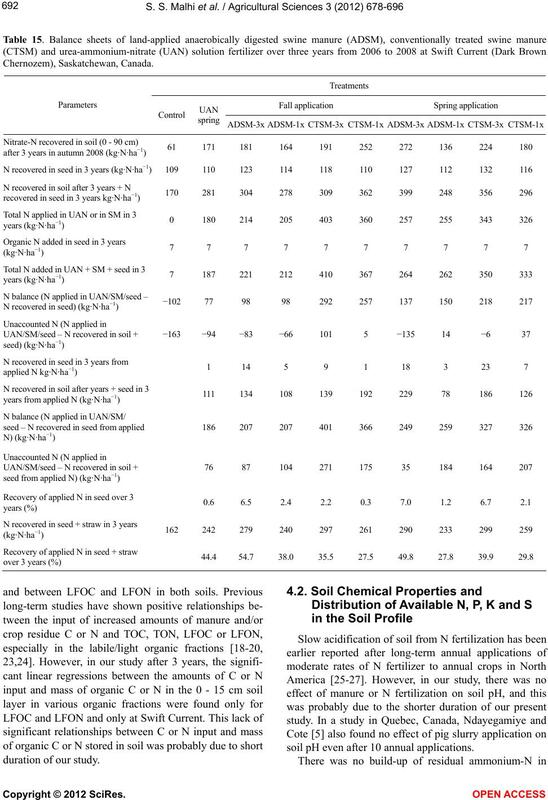 Soil and Tillage Research, 96, 269-283. Malhi, S.S., Nyborg, M., Goddard, T. and Puurveen, D.
Fertility of Soils, 47, 785-800.
soil. Nutrient Cycling in Agroecosystems, 90, 1-20. Colorado State University, Fort Collins, 63-71.
nal of Sustainable Agriculture, 19, 51-63.
nadian Journal of Soil Science, 74, 131-138. Schwab, A.P., Owensby, C.E. and Kulyingyoung, S.
years of fertilization. Soil Science, 149, 35-43. Effect of organic manure on soil nitrate accumulation. 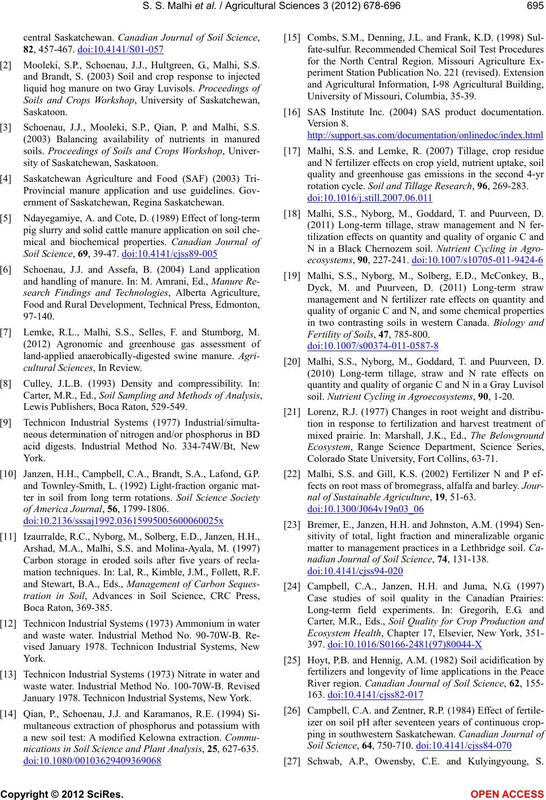 Soil Environmental Scien c e, 9, 197-200. Yang, S., Malhi, S.S., Song, J.R., Yue, W.Y., Wang, J.G. phorus placement on wheat production in Saskatchewan. 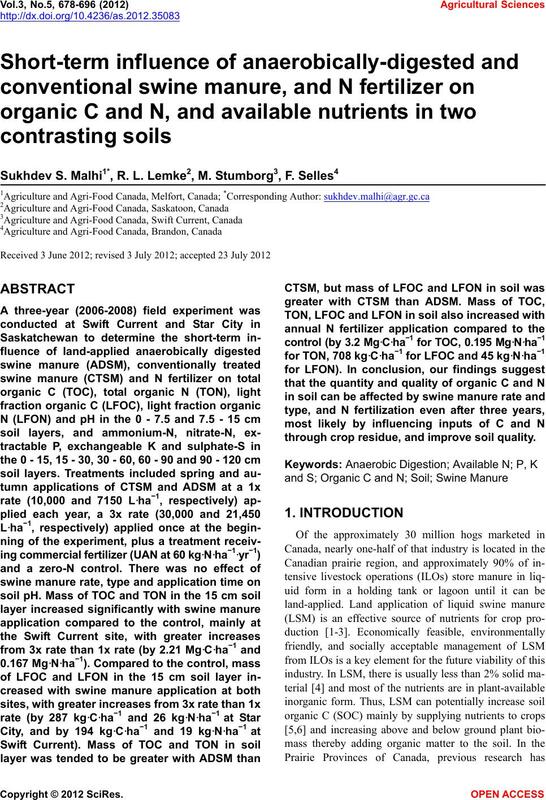 Canadian Journal of Soil Science, 90, 319-337. Nyborg, M., Laidlaw, J.W., Solberg, E.D. and Malhi, S.S.
dian Journal of Soil Science, 77, 53-160. C and N, and N and P balance in the Canadian Prairie. Nutrient Cycling in Agroecosystems, 84, 1-22. 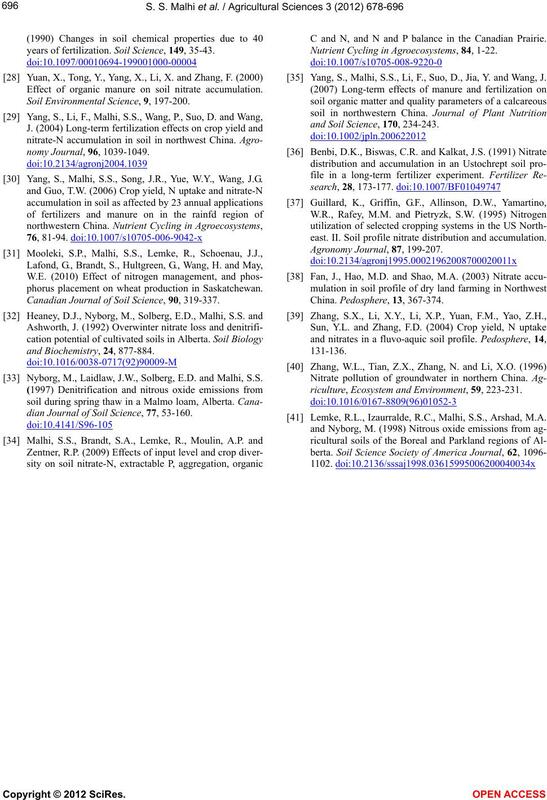 Yang, S., Malhi, S.S., Li, F., Suo, D., Jia, Y. and Wang, J.
and Soil Science, 170, 234-243.
east. II. 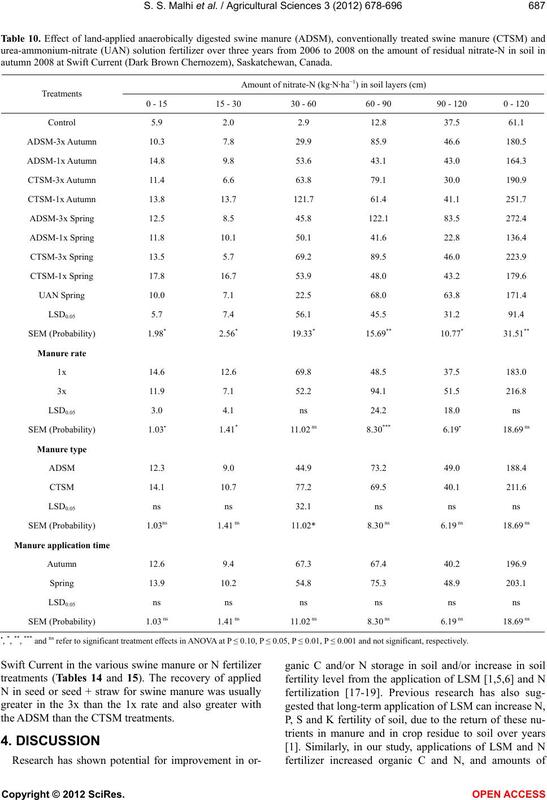 Soil profile nitrate distribution and accumulation. riculture, Ecosystem and Environment, 59, 223-231. Lemke, R.L., Izaurralde, R.C., Malhi, S.S., Arshad, M.A.